The two days of racing in October provided some of the closest results yet, on the second day, we grabbed second in class by just 0.08s!! On both Saturday and Sunday we managed two 2nd places and good points to finish the year. This meant that we finished 2nd in the class and 6th out of everyone in the Championship standings. 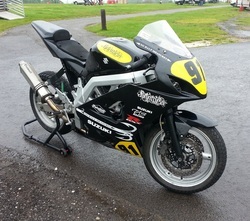 A shout out to Charlie-Rich Pitman for providing the close racing on his GSR 750. He promises more of the same next year!! So now the bikes go into hibernation and the plans for 2017 begin to simmer! Who knows what we'll be upto, but whatever, it'll be a blast! ​After a long wait it was time to try and conquer the hill at Oliver's mount once more. With the rain staying away, the times were quick all day and records were being broken for both bikes and cars. Mike struggled to find pace all day long but eventually improved his PB just a little to take 2nd in class. 1st Place went to Julian Illotson who was flying on his ER6 supertwin. Dipping into the 44s! But happy with more silverware, its now time to refresh and come back in October for a two day event of just bikes, so times should be improving even more! Check out the video for action on the mount. Filmed using a GoPro Session camera and stitched together in the editing room. ​It was time to don the novice bib again and head for the packed minitwin grid run by the NGRRC club. The paddock was fit to burst with a huge number of all kinds of bikes on what turned out to be a well run and fantastic race day event. The minitwin races were last in the order for races, with the first race run at around midday and the final race around 6pm. 23rd Position was a fair finish given that this was still a race to acclimatise with the race action again after a two year break from the last race we entered. And most importantly it was great fun! The sun was shining and the bike was working well other than a wobbly fairing which was caused by a snapped fairing bracket. So the last race was due to run at 6pm, At around 5pm the heavens opened! The sunshine was long gone and replaced with claps of thunder. We fitted the wet tyres and took some deep breaths! We contemplated not going out, the track was sodden and we didn't want another race day to end in a rebuild of either the rider or the bike! But the decision was made to go for it! If conditions were too bad we could always stop early. We were given two warm up laps and with the sun just peeking thru a little, we lined up in 23rd position on the grid. With a decent start, we were holding position nicely in corner one and tried to figure out how fast we could go. By turn 2 it was clear conditions were awful, we were three wide heading into Craner's and visibility was tricky! But then our pace quickened! Crossing the line after Lap 1 we had been overtaken BUT we'd also overtaken others so was still 23rd. The confidence was building more and more and soon the overtakes were coming thick and fast! Even as the rain started to fall again we just kept things smooth and steady. Around Macleans and Coppice two riders had fallen so waved yellows kept us all bunched in line. Once clear we managed some more overtakes including into the final chicane. We now crossed the line in 15th place! Making up 8 places in one lap. With a gap to the riders ahead we were gaining at a decent rate but it still took up a couple of laps to catch them, after some dicing among the group we managed to cross the finish line 15th out of 25 starters. Which was an respectable result in the wet and after our extended break from racing. It was good to be back in the racing paddock, still plenty of work to be done to gain places in the results but there's plenty of time for that. It was great to have enjoyed a great day out and to be home again all in one piece ready for the next event: Cadwell Park Sprint, July 3rd. After another endless winter, the pegdown boys headed back to Cadwell Park for bike testing and refreshing the riding reflexes! The forecast was grim but actually the track was mainly dry for most of the day, the only trouble being the 40mph gusts! Running thru the Gooseneck chicane was made even more challenging by the effects of the wind! Still, both the bikes behaved well and nobody crashed so all was well with the world. 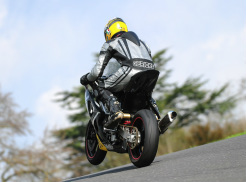 Crack on for the next event: May 2nd Oliver's Mount Hillclimb! It was a fantastic day with only bikes involved so we got loads of runs up the hill and the times lowered even more. All day long we pushed for quicker and quicker times until finally reaching the limit on the last run, it turned out to be the new PB but could've been even better had we just tried to go at 99% not 101% ! The fastest time we did was a new PB of 46.88 seconds. Class 4 was nicely full this time with 9 riders taking part. By the end of the day we were 0.1s behind 2nd place and 0.84 seconds behind the winner. and 2nd in the newcomers championship. A pleasing result with plenty to go at next year. Next year we aim to compete in both the Hillcimb championship and compete at some circuit races as and when possible. Now its time to work on the bikes and hit the ground running in the new year! Yesterday was Harewood hillclimb day! And what a track it is, we'd watched a few youtube clips before going and first thing that was noticed was: "It doesn't look this hilly in the videos!" There are blind crests, downhill braking zones and the last corner is an epic mix of carrying speed as far as possible before diving for the tight apex. The first two runs were just practices so the times don't count. Mike started with a 77 second run and then brought that down to 71.3 seconds with the second. The class Mike was in, contained two of the top riders in the National championship on bespoke hillclimb machinery, so he was a good 3-4 seconds away from them and knew a class win for the National round was not on the cards. Anyway the first timed runs began after lunch and Mike was slower at 73 seconds, must've been a heavy lunch! The second timed run was better, a time of 70.4 seconds and after initially not thinking he'd made it into the shootout, he had actually just done the 8th quickest time of the day. At this point we were extremely happy with the day, and actually went into the shootout without any thoughts of going faster, just happy with the result already. But thoughts changed on the start line and Mike went for it!! He had dipped under the 70 second mark, pulling a 68.99 second run out of the hat. We're sure it could've been better if he'd tried to be smoother but never mind! That time put us 6th overall for the day, really not bad for a SV650 against some proper trick machines including supermotos, a supercharged TL1000 and other bespoke machinery. No trophies to take home but we believe that gives us a class win for the Auto66 championship so that's the main thing. The last round is in October, back at Oliver's mount. Beautiful sunshine baked the hillclimb course in the morning and we knew it would be a day to see great times from all competitors. Unfortunately in the first few runs the cob webs really were evident and it took until the last two runs to really shake them off. With class 4 containing some good competition and a decent entry list of 8 riders, we knew it would be a tough ask to continue the good form. After the morning, all was looking glum with some poor times from Mike, around four seconds of his PB time. So after a moment to reflect and start having fun instead of focusing on the times eventually the pace improved. In the penultimate run, Mike got close to his PB with a 49.47 putting the little SV into 2nd place in the class. So it came down to the final run of the day, ignoring the time sheets, Mike went out again and hoped for more whilst trying to enjoy the occasion too! And incredibly knocked of around 0.7 seconds from his PB to post a class winning time of 48.39 seconds! 2nd place posted a 48.8s so it was a close run thing. The day after the World Superbikes had been thundering around Donnington park, we arrived to see what all the fuss was about! And with the paddock area still clearing out the many race trucks and VIP tents, we pitched up and got settled in the garages. Having never been to the track before, it was a day to have fun, enjoy the bikes and of course find anything that needs improving for future events. Andy was back too after a break from the track and it was good to see him settle into the groove and bring his pace up throughout the day. As a track it really is fun, physical and challenging with the faster sweeping corners tempting you to keep the throttle wide open! It was a great day with club MSVT and there were no track incidents to report so all in all, a truly successful outing! A mixed bag for us at the festival of speed, mainly due to the weather sadly! The Saturdays running started slowly, the heavens opened literally as the first runs were about to go ahead. So there I was sat in the holding area getting soaked whilst the officials seemed to be waiting for a break in the weather. So ten minutes after the rain started we went up the hill. The first run was awful for everyone, made particularly difficult for me following a bike dropping big oil puddles all the way up! But after the first runs were red flagged due to people dropping all over the place, the weather turned and the sun started to shine. From then onward we began to improve immediately. The first timed run we got a new personal best time of 50.21 seconds and then in the second timed run of three, dropped the time further to a 49.09 seconds. The third and final run was hampered by the rear spinning up off the start line, so it seems like its time to fit a fresher wet tyre for the next round in August. The day yielded a class win but with only two bikes in the class it seemed like a hollow victory. Sunday was forecast for very heavy rain and with 40mph winds, so we took the difficult decision to not attend. However the day did get underway later in the afternoon for the other competitors and they had some good running in the afternoon so next time we'll aim to stick it out through the weather! So after both days we are sitting down in 14th place in the championship table after loosing out on the Sunday's points. A shame but with this being our first year competing, its all valuable experience. We'll aim to close up the gap over the next three rounds coming up later in the year. Next up is a track day at Donnington park to let our hair down and have some fun, Andy will be out on his SV too after a break from riding. Really looking forward to that! Well its no TT podium but it is progress! Its spring at last and the time to get rubber on tarmac again. 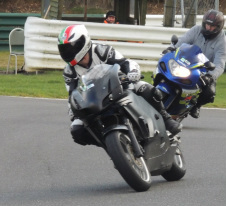 The year started with a track day at Cadwell on March 7th. The bike felt good and the winter work has been fruitful. No more false neutrals! So onto today, after an initial damp start to the day, both sunshine and the pace grew progressively thru the morning. We were entered into class 4, the 601cc-750cc category. Being early in the year, there were only three other riders in the category, nevertheless we needed to maximise the points haul to take into a championship which includes runs at places we've never even seen before. Again, a great atmosphere throughout and smiles all round from the competitors and organisers alike. Its gets our reccomendation for a cracking day out if your looking for a new challenge. Next round is at Oliver's Mount, May 2nd and 3rd. Well 2014 was a great year for PDR on track and off it. New experiences, new friends and some great fun! What does 2015 bring? Well we're certainly going to be ramping up the efforts in the Hill Climb events this year. As a newcomer we're hoping to come top three in the Auto 66 newcomers category whilst keeping sharp on the trackdays in case any racing dates become tempting! Needless to say we'll be keeping you all up to date and include some great video action from all events. Here's to the new year and all it brings! Last outing for 2014 was yesterday at the gorgeous Cadwell Park. Even in the damp, the track gives up fun and challenges in equal measure. Both bikes took to the circuit and was good testing time which has highlighted some winter jobs and parts to improve. The mods done to improve the tight corners seem to have helped on the pointy so we'll have to wait until next year to see if it translates to the hills! Time to turn up the heat and hibernate thru the winter and see what 2015 brings! A cool and damp morning awaited the intrepid hill climbers at Oliver's Mount on Sunday the 17th. With cars also on the menu we were stuck out in paddock C but soon got settled and scrutineered. The morning was supposed to comprise of two practice runs and then as many runs as time allowed after lunch. However with some of the cars causing red flags there was only one run for bikes before the timing started properly. But never mind, we got stuck in and eventually a clean run emerged from the wobbly, fifty pence cornering!! In all honesty the bike was still in track setup minus the fairings and it soon emerged that changes will need to be made to make the plucky SV into a hill climb warrior. The corners on the hill climb are tight and slow, with the bike setup for quick turn in and still using clip-ons, it was tough. But times gradually fell and would have fallen further on the last run of the day all but for the last S-bend! So with a time of 52 seconds, we finished fifth out of nine in our class (601 - 750cc) which isn't too bad considering we were up against supertwins and triumph 675s as well as the great looking classics. We will definately return next year with some changes to the bike and just to say if your considering having a go, do it!! Its a great atmosphere and a good personal challenge. Last outing on track for 2014 will be at Cadwell Park on Monday October 20th with No Limits Trackdays. So the big news is that our next competitive outing will hopefully be at the famous (and very nearby!) Oliver's Mount circuit. Sadly not on track with the Road Racing boys but with the rather more gentleman's affair of the hill climb sprints. It offers up a unique challenge that requires a different approach to that of circuit riding but should be a good day out and great way to practice the starts!! Running on Sunday August the 17th, we're hoping the sun stays out for that too. After the wet of Cadwell, a grey and sodden Blyton seemed all too reminiscent after heavy rain on the way to the track and drizzle remaining through the first two sessions. But once the clouds parted, the July sunshine soon had the track dry before lunchtime and turned out to be a great day for testing on the wets and shaking the bike down properly in the dry after the rebuild from Darley. The traffic on track was hindering progress in the inters group and with the usual ticking off for a few "heroes", it looks like time to become an extra chicane for the big boys in the advanced next time! But yet again Blyton Park delivers on quality track time and well oiled organisation. If you've not been, its well worth a go if you get a chance. A damp, dismal and drizze-ly day greeted Mike at Cadwell, seems to be a common theme developing. Still it was a good chance to run on the wets in the comfort of a trackday setting. It was also chance to shakedown the pointy sv after it went rolling at Darley. Thankfully the only issues that arose were a slipping throttle grip and an exhaust that kind of fell to bits!! With the track getting gradually worse and worse, resembling more of a river than a track, the day was cut short. Pace was improving before the weather worsened but still a way to go. So onwards to the next event, hopefully a little dryer please!! After nearly a month of tinkering in the shed, mike's SV is ready to roll once more. The damage done at Darley Moor consisted of bent forks, bent bottom yoke, cracked fairings and a beaten up exhaust end can. After sourcing the necessary parts, it was reasonably simple to swap out the parts where necessary and the bike is now all set for s Cadwell trackday on Tuesday the 28th. Its looking wet so it'll be a good chance to see how the bike handles on the wet tyres. Just hope it comes home in one piece this time!! A damp but drying track awaited us on Easter Monday. With a tentative run around in the practice / qualifying, Mike took to grid slot 14 out of 21 for Formula Darley's race 1. A poor start soon followed by some quick laps to start climbing back up the pack. After a six lap race, Mike crossed the line in 11th place or 9th in class, posting his fastest lap on the final lap of 1.07.90. The sun was now burning thru the clouds but having only entered the two Formula Darley races and the final Newcomers race, we could sit back and enjoy the racing too. Race two, again from 14th on the grid and with a slightly better start but this time it wasn't so easy to get clear laps in with the pesky 125's hanging on! Even so after eight laps Mike made a respectable 10th place finish and 9th in class again. At that point in hindsight it would've been good to pack up and go home! But we were determined to get the extra track time and stayed for the final race of the day, the Newcomers. All went well with the handicapped starts and Mike settled into his own race, sitting in 5th place until an R6 came whizzing by. Sadly at the next corner Mike tried to avoid the slower cornering rider but ended up cartwheeling through the gravel trap! After a visit to the Medic centre, both him and the bike were hastily packed away and started the long drive home! The bike will take weeks of rebuilding (We ain't professionals with a mega budget!) and so it seems further racing in 2014 is not likely. With Andy sidelined whilst moving into his new house, Mike went alone to Darley to try and prepare for the first race, due on Easter Monday. The day was perfect weather wise, after some down time due to the instructors crashing (Bruised egos but fine!) the fresh Pirellis were scrubbed and the lap times came down. Fastest lap of the day was a 1m11s, around 10 seconds down on the fastest boys on the 650s. Still not bad seeing as we are lacking the extra 10-20hp they're packing! Shout out to the old boy next to me in the paddock, 76 years young, one leg and still setting a good pace!! A friendly scrutineer looked over the bike and gave it a thumbs up, so should be all set to go! ! In case you missed it on the bikes page, we're glad to present Andy's bike in full trim for 2014. The CDI replaced she's firing on all cylinders and good to go! The aim was to see how the bikes were performing, making sure they're making standard power at least and also to get some help diagnosing Andy's (SVGTI's) curvy model which was running poorly last time out. Thankfully we now have an answer and it seems a poorly CDI unit needs replacing so there was no point doing a run on the curvy until a replacement is fitted. 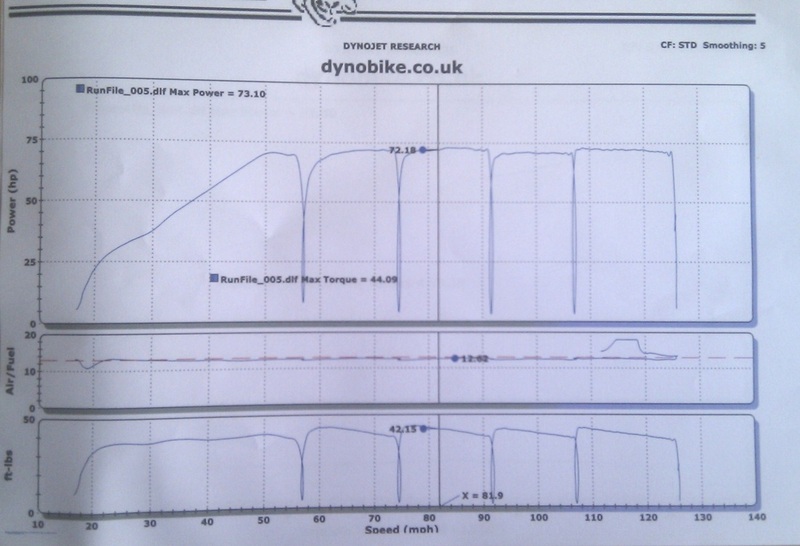 We went to see Paul at Dynobike in Malton: http://www.dynobike.co.uk/ an established dyno test centre, with 15 years bike and car experience. The good news is that the pointy bike made bang on minitwin power, 72hp at the rear wheel, its running a standard ECU, beowulf can with baffle in, pipercross air filter and with the snorkel in place. A frosty March morning welcomed the hardy few at Cadwell on Saturday March 1st, even so after a sketchy sighting session, the track dried out and both of us enjoyed a great day back on track. Didn't stop a few people sending themselves flying at the Gooseneck, but we avoided the green stuff and went home buzzing and ready for more. Thanks to the No Limits crew for a smooth running day and for helping us sort out a little issue with the booking! The main low was that Andy's carby SV wasn't enjoying it as much, seemingly down on power and hesitant throttle response. So this week has been fault finding, the carbs are out for a good clean, so hoping she'll be right again soon. Now where to book next? First race ever for peg down racing will be at Darley Moor on Easter Monday, entry for the Formula Darley round and the Newcomers has been sent off and all being well we shall be there, and maybe, not just to make up the numbers!! Having 'ummed and 'arrd for a while, NGRRC seems like the best option for us Northern boys to get in on some Minitwin action. Membership form sent and hopefully we'll be there on May 10th for the Cadwell round. Oulton Park may have to wait until next year. Keep an eye on the events page for final confirmation, still hoping to get a race day in before that to get up to speed. - Andy's bike should be rolling out for pictures in the next week or two! Finally some excitement! A happy new year to all! Hope you all had a good break. Bikes are still undergoing some small tweaks but all is looking well for a March re-awakening! Check the events page for further details. Still feels a looooooong way to go, but the weeks will fly by and we'll soon get the pre-track jitters on a cold n frosty Lincolnshire morning! Andy's SV will be sporting new skin, Mike's SV has a new lightweight rear end thanks to RVRacing and is hoping to have re-worked forks (Hurry up Debrix!). Of course photos will follow soon on The Bikes page. Stay tuned. Looking forward to 2014. Hope you can join us for the ride! Although further days on track are never out of the question for the rest of 2013, its looking pretty unlikely, so bikes are starting to undergo further developments. 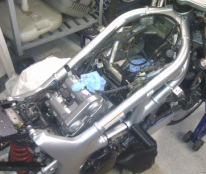 For Andy, the rear is apart for tidying and cosmetic work and new fairings are under consideration! A quick action throttle is also required for achy wrist reduction. For Mike, the rear needs a rework, the seat and original subframe are not providing enough room for a fully grown bean pole! The seat is to be decided upon, either keeping the GSXR or a new Fireblade version is sprayed and ready to try out. Other incredible top secret development is of course underway but not listed to keep the edge over the competition! Having waited for what seemed like ages from Blyton, another early morning start saw us bombing over the humber bridge to Cadwell once more. What could be better, a whole day on track with great weather on the forecast. And we're glad to report a successful day was had by all! Andy, returning to Cadwell since almost breaking a collar bone a year ago at Mansfield corner, had some jitters about returning but was soon back in the flow again. The rearset risers fitted the week before gave no issues with riding the bike and will ironically help stop him getting the pegs sparking again! On the pointy, Mike was initially frustrated by traffic but with the new plan of getting right to the front of the queue, soon the times were gradually falling until the best time of the day was recorded at 1m54.87. Not too bad but still improvements to be made with both getting the power down and consistency, we're sure a decent race pace isn't far away. So both riders enjoying fun in the sun before winter sets in, question is, will there be more in 2013? Or will the winds turn and hibernation kick in? A quiet weekend in September saw an opportunity for Mike to finally get the CTC course done and ACU club membership obtained with Darley Moor Motorcycle Road Racing Club. Big thanks to Eddie Nelson the club secretary and all round good guy for putting up with the last minute organisation and pestering questions! Please visit the Darley Moor Website for some great info and all sorts of great stuff! So eye test complete and forms in the post, finally the licence dropped thru the letter box complete with the orange bib of shame and gurning photo ID! Now just some further tinkering with the bike to make it ACU compliant and we're all set for 2014! Check out the events page for race events confirmed. Our closest circuit to home and a great place to find the limits due to the huge run off areas! Our favourite instructor Geoff giving it some on the sighting laps and a dead gazebo all part of the Blyton fun. Andy grabbed the headlines with his sparking peg antics, but sadly the other news was our work colleague taking a tumble when coolant spilled onto his VFR's rear tyre. We sorted him out with a new brake lever and he limped home with a few new black and blue bits to hide from the missus!! 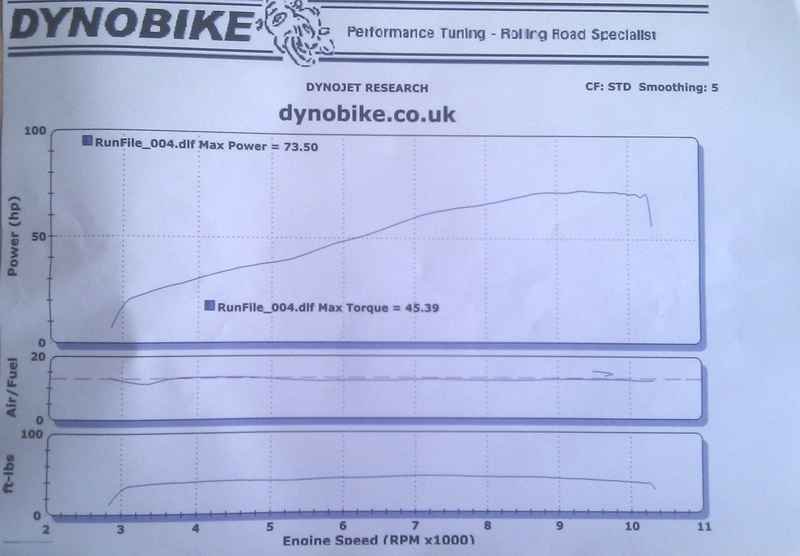 Mike had fun with a Panigale, chalking one up for the SV with a power output less than half the Ducatis! See the videos page for the proof. Check out BikeDays.co to book your own day on the old airfield circuit, fresh tarmac makes it a super smooth safe environment to really get your game on.